My hand me down vibratory cleaner finally died. My FIL bought it in the 80s and I've probably cleaned 100,000 rounds in it over the last 7-8 years. Worked fine (before it stopped) but I wanted to try the Frankfort Arsenal wet tumbler. The only thing that made me hesitate was the SS pin removal after. Just seemed like it would be a pain, messy and time consuming. I ordered the magnet (and brass dryer) with the tumbler so I have the option but I'm not sure I'm going to need it. Below are my results. Hot water, dish soap and Lemi-shine. NO pins. The 2 hour has a little brighter shine - not sure if you can pick that up in the photo. I'm pretty impressed and will probably do the 2 hour going forward WITHOUT pins. Tumble, drain, rinse and then put them in the dryer. Pretty simple and very clean VS all the dust from my vibratory tumbler. 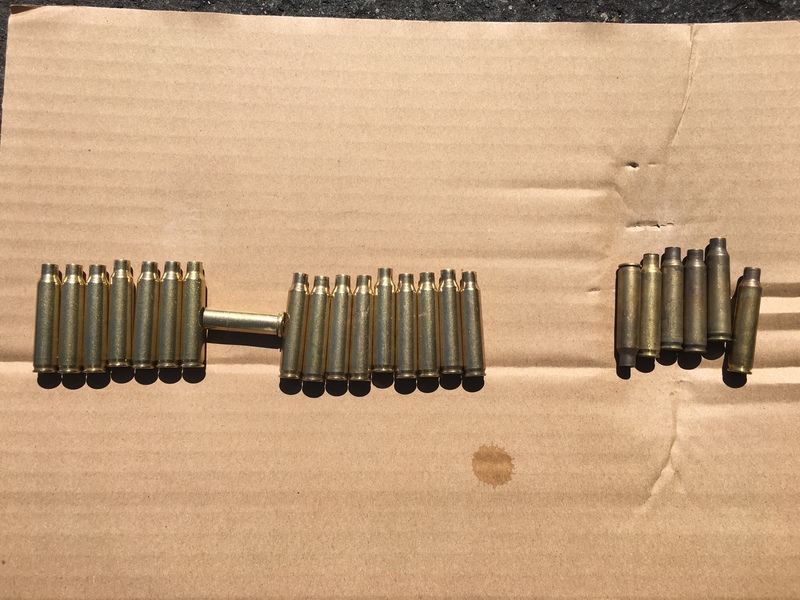 I've got about 2,000 5.56 brass (from a suppressed SBR) in now. 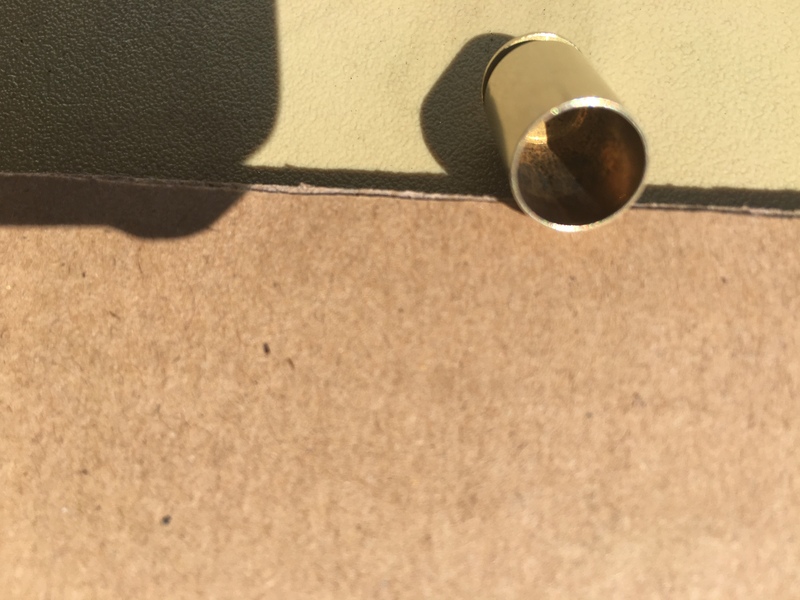 They look a lot worse than the 9mm so I'm curious how well the NO pins works with them. Hot water, a little Dawn and some Lemi-Shine again. I'll update when they're done with their 2 hours. Table full of 2 hour - the ones that look darker are nickel, not dirty. Last edited by LittleLebowski; 04-02-2017 at 11:32 PM. Does the pinless tumble clean corrosion and other yuck from the interior of the cases? I get cheap thrill bringing old, grungy Pleistocene epoch brass back to life. Pretty well, yes. Sparkling, no. My standards may be different than yours though. Last edited by punkey71; 03-22-2017 at 10:40 AM. I tried it with the pins for a while. I've now gone to no pins and there's no way I can see myself going back. The pins are a pain to collect and you always end up with errant ones on the floor, they help bind various caliber cases together and I always had a few pins left in the cases that I'd catch right before they went into the de-priming station. The cases are definitely less pristine sans pins, but I don't think the difference between the two is meaningful. 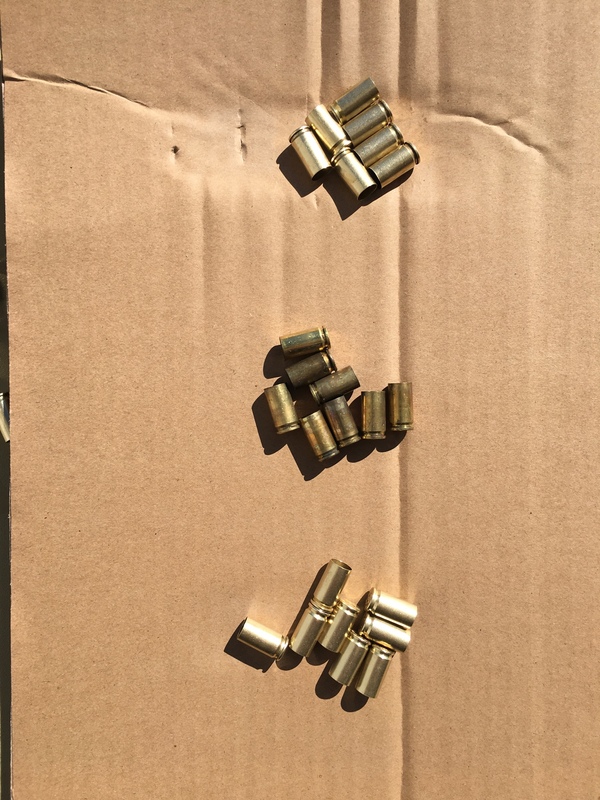 If anything, I have noticed less issues with "sticky" brass now that I've removed the pins from my cleaning rotation. Yeah. My pins are staying in the package. NO pins is fine for my 9mm loading. Last edited by punkey71; 03-22-2017 at 11:11 AM. 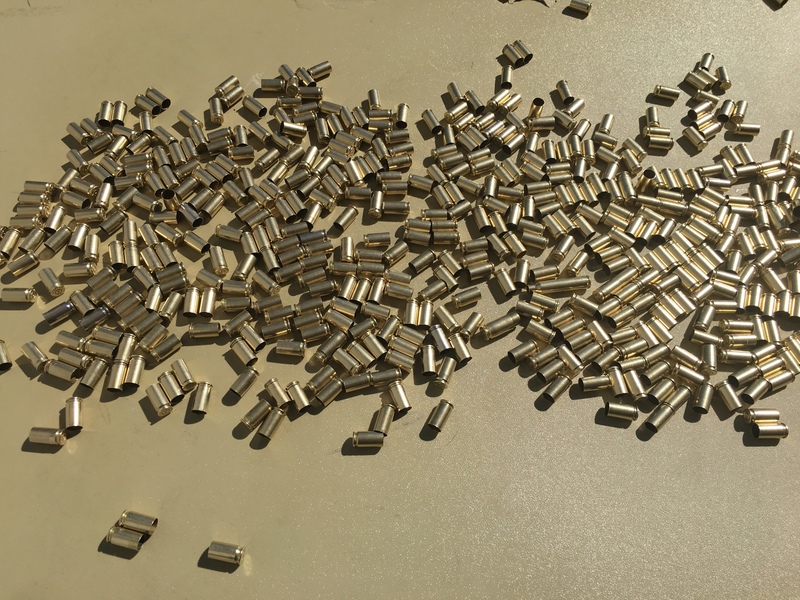 I started tumbling without the pins awhile back, as I found that when you get pistol cases sparkling clean, I started having problems with the cases sticking to the powder funnel on my dillion presses. The residue that's left inside the cases after tumbling provides enough of a lube to prevent the cases from sticking. I also found out that by leaving the pins out the capacity of the tumbler is now increased. My tumbler is rated for 17lbs total, So, 5lbs of pins, gallon of water (8lbs) leaves you with 4lbs of cases that you could tumble. Without the pins, now you can load 9lbs of cases. I usually run my pistol cases about 45minutes, they come out clean. Like any other tumbler, the more cases you can get into it without overloading, the better the results are. After tumbling, I put them in the dryer for an hour. Also, I don't deprime the cases before tumbling either, an hour in the dryer and the primer pockets are dry, even with the spent primers left in place. Getting the primer pockets sparkling clean is pretty much a waste of time,especially with pistol ammo. Rifle cases being loaded for a match, yeah, I could see doing it, but for most practice ammo, no..
Last edited by ralph; 03-22-2017 at 12:39 PM. @GuanoLoco doesn't use pins and he is the SPOC of anything reloading. before the stainless pins were a thing. I used their solution, and they always came out very shiny. I setup a decap die and cranked them through the 650 to pop the primers out, partially because I was curious to see how the primer pocket would come out but mainly because I will probably swage them. But the pins are awesome, but they are a PITA, and my RCBS experience is that unless the cases are REALLY nasty you don't need them. I will continue to utilize both the F.A.R.T and the Dillon vibrating bowl. One consideration with liquid is I might run them after sizing, and at that point they will not have primers and another advantage is there will be nothing to get stuck in the flash hole. Punkey71--This is looking a lot more interesting to me now that you've shown that the pins aren't needed. I'm considering getting a $150 cement mixer from Harbor Freight so I can process in bulk. The only remaining problem to be solved is drying. Humidity inside my house is pretty low (30%RH)--even martial arts gi's dry very quickly. So, I'm thinking that simply laying the brass out on a towel may be sufficient.